My hubby and I both agree that our Baby Bunny will always have new, well-made shoes. It’s one thing we won’t get used. At the end of March, we bought Baby Bunny her first pair of good shoes for cruising around at the park, a size 0-6 month PediPeds. There was a discount if we bought 2 pairs, so we bought the next size up, 6-12 month, at the same time. 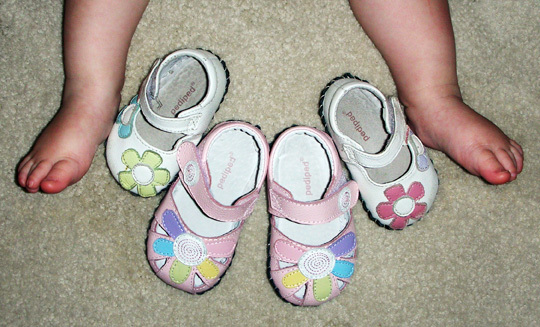 So when she finally outgrew the 0-6 size shoes this past weekend, at nearly 14 months old, I pulled out the next pair. They are HUGE! They look like clown shoes on her, and have tripped her more than once. There is way to much of a jump between these sizes, pictured below. The jump in size from 0-6 month to 6-12 month PediPed shoes is huge! We headed out to several stores searching for an in-between shoe in another brand, but with little luck. Most shoes her size are crib shoes with flimsy soles meant to just look cute (and they do). After our failed shopping trip, I figured we’d just live with the shoes and she’ll grow into them. I came home last night to a dime-sized red bump on her forehead, and 2 slightly skinned knees. She’d had a slight fall on her daily walk with daddy & doggy around the block. I’m pretty good about not freaking out about these things, but still, it’s hard to see that perfect tiny body I would do anything to protect, get hurt. Kids Foot Locker – Nike Free fit pretty well, but were not in stock in a girls color, in her size. Also, I worry a full sneaker is too much for her developing little foot. I’ve always preferred to try shoes on before buying, but I’ve done some online research also, since the really tiny sizes are harder to find. I’m impressed at the number of companies that make baby & toddler shoes. The baby Merrill’s & Teva’s are adorable! If we can’t get something in store, I may try ordering one of these. This weekend we’ll venture out to the bigger mall in search of shoes for those adorable tiny feet. If you have any suggestions for good, very tiny shoes, leave them in the comments. I’ll report more on the pros and cons of what we find. Placing Bets – How Much Will She Weigh? Tomorrow, I take my Baby Bunny back to the doctor for another weight check. Seven weeks ago she was 15lbs. 15oz., at 1 year and 1 week old. We were told to give her a high fat diet and come back to see if we could push her up to at least the 1st percentile. So what do we responsible parents do? Place bets. The stakes? Dishes for the weekend. He was trying to get her to eat extra guacamole & cheese tonight in the hopes of packing on an extra ounce before tomorrow. But, I’m hoping my track record of weight prediction will stand. I was weighing her every 1-2 weeks at one point, so I got good at it. Of course, both of our guesses probably mean the same thing – the doctor will be ordering tests to see why she’s so darn small. We won’t know until tomorrow, so no more speculating tonight. At 6lbs 4oz., 20 inches, and 5 days late, my baby girl was tiny from the beginning. Around the 6 month mark, her weight gain slowed and as a breastfeeding mother, it was to be expected, however, as her percentiles continued to drop, the pediatricians continued to be cautious with extra weight checks between visits. After I returned to work after her first birthday, my husband took her to the first doctor’s visit I didn’t attend. When his report included the recommendation that we put butter on all her food, I started to freak. Could this really be a healthy option for a child forming her lifetime eating habits? I no longer had the regular new mom and breastfeeding support groups that had kept me calm about her weight. And while I have one evening support group I still attend, I needed another outlet and choose to start Petite Child. Even though my baby Bunny has met and exceed all other development factors to date, the weight “issue” is still part of our lives. It is my firm belief that she is a perfectly healthy, but petite. My aim with this blog is to connect with other moms and share my story so parents with their own petite child can celebrate the joys of tiny tots!